Train, car , bus or plane : choose your transportation! Train, car, bus or plane: choose your transportation! Paris, Saint-Malo, Brest, Camaret, Clermont-Ferrand, Saint-Jean de Luz, Perpignan… you’d love to visit those magnificent cities and booked a trip with France écotours… but don’t know how to come? Here are some insider tips to travel to your dream French city! Get an initial overview on Gopili, the website compares the pricing of different transport means whilst travelling in Europe. Flying to France might sometimes be the only way to get to our homeland. However, planes emit a lot of pollutants, and one needs to think about it when catching a plane. That’s why we suggest you take the time to compensate your flight emissions with our partner Atmosfair. This is a climate protection organisation with a focus on travel that publishes climate rankings of airlines (very interesting!). Just have a look at their comparator, go climate conscious! To learn more about this eco-friendly organisation, read our post. Book with a low-cost company: there are more and more low-cost plane companies allowing you to travel for a very small budget. However, you won’t be permitted to carry a lot of luggage on board. Most popular ones: Ryanair, EasyJet, Transavia. Book with a travel search engine: many of them will enable you to find your flight at the cheapest price. We recommend: Skyscanner, Kayak, Momondo and Google Flights! Don’t hesitate to compare the results of those search engines! Although a bit time-consuming, this method might save you a few hundreds of pounds or dollars. Be assured to pay the cheapest price: with OptionWay, you can buy a ticket… and the website will reimburse you the difference if the ticket goes any cheaper! Does not work for low-cost and group tickets. OptionWay takes a 30% commission. If you are from Canada: Yulair will tell you all the cheapest flights from Montréal. Book your flight ticket on Tuesdays or Wednesdays between 1 and 4 o’clock. Use incognito mode to search your flight. / Before booking it for real, delete your Google browsing history and reboot your internet box or use vpn connection. Many flight companies will else track you and make you pay more expensive prices. Set your computer/smartphone to only accept cookies from visited sites and refuse geolocation if it is not necessary. Be flexible on your departure dates: arrive one or two days before the start of your organized France écotours holidays can save you several tens, even hundreds (if you come by plane) euros… and leaves you extra time to discover the area! Before paying, remember to check that you have not inadvertently ticked any additional options (snack, seat reservation, etc). Book a ferry: you can book with several companies: Brittany Ferries, Condor Ferries, DFDS Seaways, Irish Ferries, P&O Ferries, Stena Line. However, we recommend using the following comparison website A Ferry. This site compares all the ferry companies and routes to France for you. Book an exchangeable and refundable ticket: book as early as you can to benefit from SNCF’s offers. And with those “exchangeable and refundable ticket” (make sure to chose this option ! ), you can exchange them for a few euros if you can’t make it! Take a night train: in France, night trains are often cheapers and sometimes more direct than regular day ones! Take a Ouigo train: those “low budget” trains are stopping at less-frequented railway stations, but can be an amazing way to travel through France. However, keep in mind that you shouldn’t check only this website, but also others such as SNCF, as “last minute” train tickets with SNCF can be cheaper. Take a regional train: regional trains are much slower, but at the same time cheaper. A nice way to discover magnificent French landscapes and to easily get to the starting point of our hiking. Moreover, you can take your bicycles with you! Book with a train tickets comparator: we highly recommend you use TrainLine. Register with an email address and fill up your profile to have the best prices in whole Europe. Buy second-hand tickets: many people book a train they won’t be able to attend and then resell it on the Internet. Why not getting yours here? In region Languedoc-Roussillon (where we offer a lot of travels…): you can get a regional train or a bus for 1€! If your flight lands in Belgium: Izy offers you Brussels-Paris from 10€! Be clever and use the interrail’pass if you intend to travel through several European countries! You still don’t know how to get there? Search with a comparator: Gopili will help you find the cheapest way to get there (plane, bus, carsharing, train…). Share a car! : Carsharing is cheap and eco-friendly, so why not using it? You can choose your partners over some particular criteria: non-smoking, ladies-only, luggage size, etc. We highly recommend Blablacar , a website really easy to register to! Rent someone else’s car: TravelerCar enables you to rent a car from someone who left on holiday. The car is insured. You can also have a look at Drivy. Buses are one of the most eco-friendly transportation. Besides, since 2015, it’s really cheap in France. Book directly with the bus company: FlixBus, Ouibus, Eurolines, etc. Journeys will be longer, but these buses often offer Wifi, WC, and plug sockets! Book with a comparator: ComparaBUS or TicTacTrip analyse most of the bus transfers in Western Europe to help you get yours at the cheapest price! Off to France: Travel smart and travel cheap! Travel the #ecoholidays way. 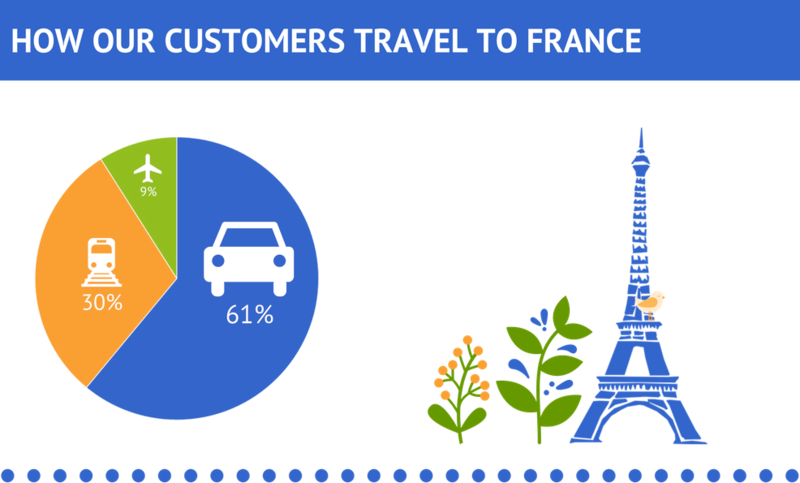 Paris, Saint-Malo, Brest, Camaret, Clermont-Ferrand, Saint-Jean-de-Luz, Perpignan: these special French cities are where most of our ecofriendly trips start – most of them can be reached with great ease. You can find the different means of reaching these destinations above. We have included useful links for online bookings and carpooling. Do you speak some French per chance? Make use our French price checking websites. Clients often ask us for the best ways of getting in and around France. So we gathered some information on travelling cheap but also travelling eco-friendly. Find it in our infographic below. We do our best to update travel options regularly. We hope you recommend us! Good or bad, your feedback is always welcome – there is always room for improvement!